On this date in 1606, the English Jesuit Henry Garnet was hanged, drawn and quartered in the churchyard of Old St. Paul’s Cathedral. Garnet, “the prime scholar of Winchester College” as a gifted young student, left England to enter the Society of Jesus and study under Robert Bellarmine, a theologian so Catholic that he would later bring the hammer down on Galileo’s heliocentrism. After eleven years in letters on the continent, the Society called Garnet to return to England in 1586 as the lead missionary to his native realm’s Catholic minority. 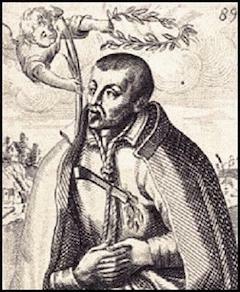 It was a lonely burden for Garnet, especially after his opposite number Robert Southwell was arrested in 1592. (Southwell, too, went to the scaffold.) But Garnet carried it off as well as anyone. He remained free for nearly twenty years — creating an underground press and numerous illegal cells. “Under his care the Jesuits in the English mission increased from one to forty, and that not a single letter of complaint, it is said, was sent to headquarters against him,” lauds the Catholic Encyclopedia. Theologically, Garnet was noted for his defense of the doctrine of equivocation — that is (in the hostile reading of its Protestant interlocutors) of finding hair-splitting rationales for lying. It was an intellectual exercise of many centuries’ vintage, but for England’s beleaguered Catholics it was as urgent as life and death. Most specifically, this doctrine reckoned an oath insufficient to compel a truthful response to official inquiries as to the whereabouts and activities of fellow-Catholics who’d be liable with discovery to attain martyrdom. The liberal definition of “truth” to include an outright lie with a “secret meaning reserved in [one’s] mind” was obviously ripe for the scorn of persecutors for whom it was little but treason neatly clothed. Knock, knock! Who’s there, in th’ other devil’s name? Much of Garnet’s last weeks in custody ahead of his execution were spent in harrowing the doctrine of equivocation; indeed, this is even the very last exchange he had with doctors of the English church sent to accompany him. There were nevertheless equivocations that Garnet would never countenance. His A Treatise of Christian Renunciation, compiling quotes from Church fathers detailing the things a good Catholic must be prepared to renounce for his faith, excoriated those who attended Anglican chuches. Their pretense, he said, was nothing but their own comfort. Judas with a kisse dost thou betray me? amongst hereticks dost thou professe me? no other place to professe chastity, but in the bedd of a harlott? Harried as they were, England’s Catholics greeted with anticipation the 1603 accession of King James: raised Protestant, but the son of the Catholic Mary, Queen of Scots. Garnet shared Catholics’ hope that James would ease off harassment of the Old Faith; he even authorized the betrayal of fellow-Catholics’ regicidal Bye Plot as a show of loyalty and to pre-empt a possible backlash. “Quiete et pacifice,” he begged. But toleration was still not quickly forthcoming, and soon Catholics had reverted to “a stage of desperation.” James was only in his thirties: would the trials be neverending? Garnet continued endeavouring to keep Catholics calm and give the new sovereign the political space necessary to relax persecution. But many of his flock soon tired of quiete et pacifice. In 1605, there would be another try — one that is still remember, remembered to this day. Here Garnet again gets into hot water with theological doctrine. Garnet caught indirect wind of Guy Fawkes’ terrorist plot — but he heard it kind-of-sort-of under the seal of the confessional: another priest who himself had heard the design under confession told it to Garnet in a more ambiguous circumstance. Garnet’s excuses here might strike the reader as far too fine; certainly that is how his prosecutors viewed it. The circumstances of the plot’s revelation certainly appeared to give the priest enough leave to find a way to reveal it, especially since he knew about it for many months before that almost-fateful Fifth of November. Garnet seems to have wanted the resolution — or loathed to plant another Judas-kiss. Maybe he thought his exhortations could stop it without anyone winding up drawn on a hurdle. Maybe, after 19 furtive years knowing every morning that his next sleep might be in a dungeon, his heart of hearts wanted to see it to go ahead. When the attempt to explosively decapitate the English state was discovered Garnet was hunted to ground; his last days of “liberty” were spent stuffed in a coffin-sized priest hole at Hindlip Hall before the “customs of nature which must of necessity be done” finally forced him to out into the sight of his captors. His fate looks like a foregone conclusion in retrospect, but Garnet did fight it — for two months before his condemnation, and five more weeks after from trial until his execution during which he maneuvered to exculpate himself. (See Investigating Gunpowder Treason for an exploration of this.) Since Reformation English law of course did not recognize the seal of the confessional, the most charitable reading of Garnet’s own admissions start at misprision of treason. It is but a single step from there to the scaffold if one supposes his long silence shrouded any sort of approval of or aid to the plotters. Garnet received the mercy of being hanged to death before he was cut down for the public butchery part of his sentence. 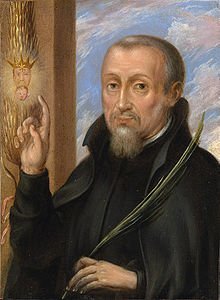 June 23, alas, was the end of the line for Jesuit Thomas Garnet, martyred on that date in 1608 for Catholic proselytizing in England. Now accounted a saint and one of the Forty Martyrs of England and Wales, Garnet was the nephew of Henry Garnet, a priest executed in 1606 for complicity in the November 5, 1605 Gunpowder Plot. Thomas, too — then about 30 years old — was arrested during this same backlash, and put to torture for evidence against uncle Henry. Thomas had been exercising his covert ministry in England since 1599, after slipping English custody once before. As a result of the Gunpowder Plot hubbub, Thomas Garnet was among 47 Catholic clerics shipped across the English Channel to Flanders in July 1606, where they were warned that they faced execution should they ever again be caught in England. Garnet’s remains were translated back to his Catholic school on the continent. In more tolerant times, long after Garnet’s death, this English Jesuit school finally had liberty to relocate back to England proper. While Garnet’s relics were destroyed in the French Revolution, he remains the protomartyr (the first martyr associated with a place) of the venerable Stonyhurst College, now in Lancashire.